The Conservancy has expanded its vision to include “whole place preservation” as a part of safeguarding our village history and preserving the treasures the community values so greatly. We wanted to learn how to protect the best of Bronxville by understanding how the natural features influenced the shaping of the man-made landscape. We also hoped to determine what stewardship is required to conserve the best features of the village. To meet those objectives, the Conservancy funded a project in conjunction with Peter Gisolfi Associates to investigate the natural features that have determined the character of the landscape in the village in order to know how the cultural features were overlaid on the natural setting. By mapping the physical geography of the village, we have been able to produce an analysis of Bronxville’s natural landscape which includes such things as its geology, topography, vegetation, hydrology, slopes and soils. A second series of maps provides an analysis of the cultural landscape of the village, including patterns of development, neighborhood and construction chronology, land use and zoning. The book also contains a listing of the trees, shrubs and plants that are native to the village as well as a list of the plants that are considered invasive, many of which are banned in New York State. The result is an informative and visually impressive document which identifies the four landscape types in the village and the differences between them. Strategies based on this knowledge can now be developed to conserve and enhance the surrounding environment. 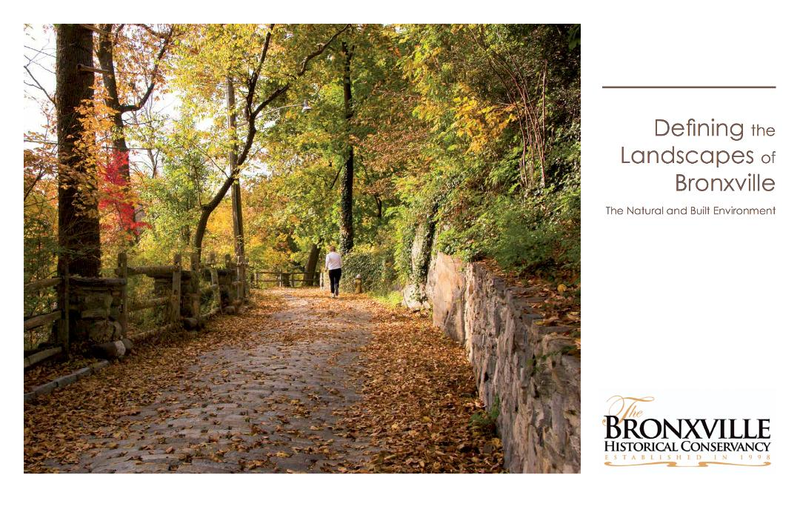 This study, entitled Defining the Landscapes of Bronxville, is now available for sale at the Village Hall. 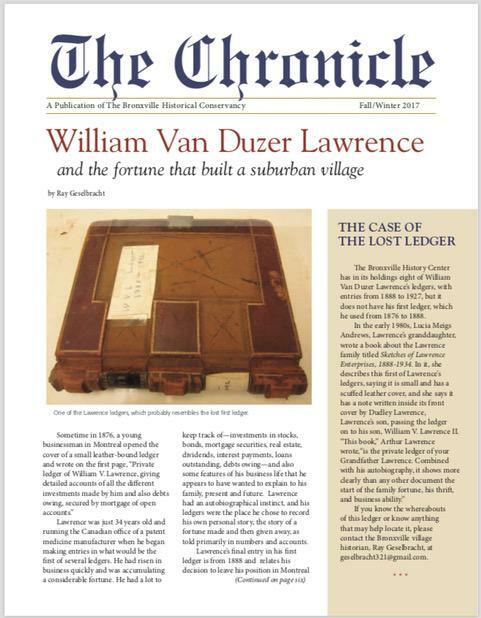 Bronxville’s popular history, Building A Suburban Village, published during the Village’s centennial celebration in 1998, is available for purchase once again. 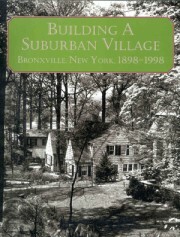 The richly illustrated, 352-page book tells the story of the development of Bronxville, neighborhood by neighborhood, from a sparsely settled 19th-century farm community to one of the nation’s premiere metropolitan suburbs. 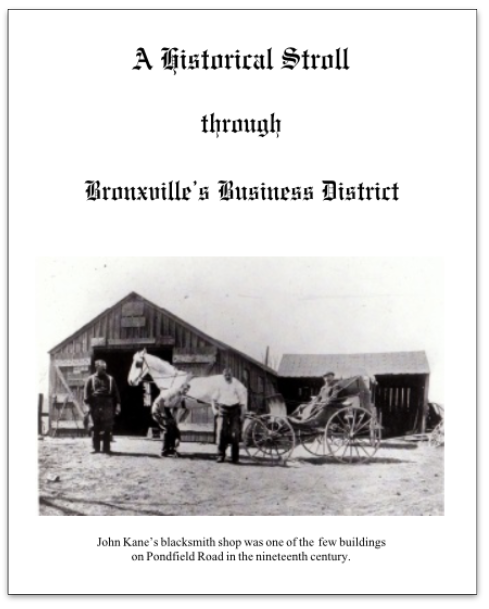 Researched and written by a team of 33 local historians led by Editor Eloise L. Morgan, now Village Historian, the book was published by the Bronxville Centennial Committee, Inc., which became the Bronxville Historical Conservancy. Although still frequently requested at local bookstores, the first printing of the volume sold out nearly three years ago. (One copy was on sale on eBay in 2011 for $330 — over six times its original sale price!) The Conservancy commissioned a reprint edition from the same company that did the original book. 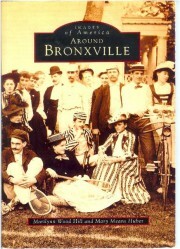 An attractive 128-page soft-cover photo history of Bronxville with 230 vintage photos offering a delightful, entertaining look at public and private life in the 19th and 20th centuries. This history of Bronxville provides fascinating photo captions filled with facts, legend and lore written by Marilynn Wood Hill and Mary Means Huber. To celebrate its tenth Anniversary, the Bronxville Historical Conservancy published this 64-page full color catalogue by Jayne Warman, curator, and Marilynn Wood Hill, editor, to accompany an exhibition held at Concordia College’s OSilas Gallery in Fall 2008. 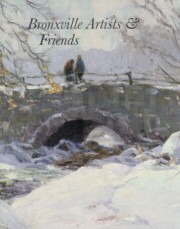 Bronxville Artists & Friends illustrates not only the works exhibited, but also the paintings in the Conservancy collection, and includes a commentary on each work and a biographical sketch of each artist. 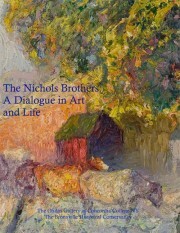 This catalogue contains an image of each painting in the OSilas Gallery Nichols Brothers Exhibition, October 2010. Curated by Sarah Underhill and Barbara Sussman, the exhibition brought together for the first time an exceptional group of paintings and works on paper by former Bronxville resident-artists Hobart and Spencer Nichols, creating an opportunity to explore the visual dialogue between these brothers. The accompanying text shares an insight into the lives and work of the artists. Published twice-yearly, in the fall and spring, The Chronicle keeps members up-to-date on all the many Conservancy activities and concerns, from announcements of the organization’s public lectures and events, to news of the on-going work of its many active committees. Currently edited by Irena Choi Stern, The Chronicle is a warm reminder of all the conviviality and camaraderie that goes along with being a member of the Bronxville Historical Conservancy! An illustrated and self-guided walking tour through the village’s “downtown.” The images represented are from the 1880s to the late 1920s when Bronxville was changing from a rural community to a much sought-after residential suburb. A Scavenger Hunt for children, Grades K-5, and their parents. Find the “hidden treasures” along Pondfield Road. A Scavenger Hunt for children, Grades K-5, and their parents. Find the “hidden treasures” at the Library! Although Bronxville is small, it has a rich history. For more than two centuries notable and colorful — as well as ordinary — public citizens have left interesting legacies. 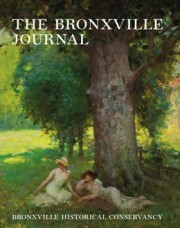 The Bronxville Journal, edited by historian Marilynn Wood Hill, captures many of their stories, illuminating little-known aspects of Bronxville from the early 19th century to the present in its annual editions. 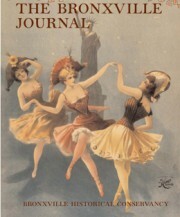 Volume I, published in 2002 under the guidance of editor Marilynn Hill, featured Francis Edmonds, one of New York’s leading bankers, who was equally talented as an artist; Harriet Hubbard Ayer, a socialite who lived in Bronxville’s insane asylum; the early women of the Bronxville School PTA; a tribute to Frieda Wildy Riggs; an engaging piece on Edmund Clarence Stedman, a blue-eyed poet who was as comfortable at the center of New York City’s literati as he was in the canyons of Wall Street, and the words of Paul Goldberger on The Power of Place, the subject of the first Brendan Gill Lecture. 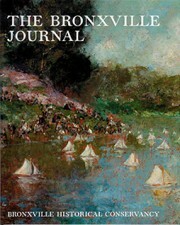 Volume II of The Bronxville Journal, released in 2003, had an equally fascinating line-up: the Bronxville life of late-night television talk-show host, Jack Paar; the story of Samuel Alexander Scribner, a circus owner and burlesque businessman; an interesting but little-known connection between the architect of Bronxville’s Concordia College and Ellis Island; and William Lawrence’s plan for Sarah Lawrence College, the “finishing school for girls” that has become the outstanding college we know today. Articles in Volume III of The Bronxville Journal, published in fall of 2004, ranged from those who were passionate about art to those who protested war. Art Historian Meg Hausberg explored the relationship between Lawrence Park artist Otto Bacher and James McNeill Whistler. Sarah Underhill, who grew up in Bronxville in the 1970s, revisited a poignant episode in the village’s past in “The Mothers’ March for Peace,” a protest against the Vietnam War. Marcia Lee, former mayor of Bronxville, reflected on “When the Lawrence’s Left Bronxville,” the departure of the family whose name in the first half of the 1900s was almost synonymous with Bronxville. And historian Marilynn Hill looked at village life in the mid-1800s by discussing medical practice and care in early Bronxville as recorded in several diaries of the period. Growing Up in Bronxville During World War II, by Eliot N. Vestner, Jr.
Three Bronxville artists who created set designs for some of America’s top theaters at the turn of the twentieth century are featured in Volume 4 of The Bronxville Journal, released in Fall 2009. Dale Hanson Walker, great-granddaughter of one of the artists, has shared family mementos as well as memories in her lively story of this seldom explored aspect of theater history. 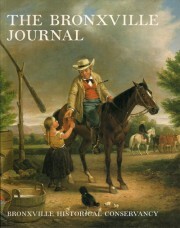 Also in this edition is a biographical essay by Village Historian Eloise Morgan about a Lawrence Park resident who is said to have been the inspiration for the adventure hero Indiana Jones. Lifetime village resident Anne Fredericks reminisces about the election of 1936 when responses may have appeared subdued by today’s standards, but emotions also ran strong among many Bronxville residents. Local politics four decades later is the subject of an article by former Bronxville mayor Marcia Lee, who looks at the women’s liberation movement of the 1970s as well as other social changes of that era that helped reshape the character of village government. Marilynn Hill featured one of the Hotel Gramatan’s many notable resident guests, Varina Howell Davis, widow of Confederate President Jefferson Davis, who left a unique record of her hotel stay that is little known to Bronxvillians today. And, finally, this fourth collection of local historical essays showcases two other approaches to preserving history — the poetry of John Barr, a nationally recognized poet, and visual records from the portfolios of contemporary photographer Judith Watts Wilson and some of her Bronxville predecessors who have captured scenes of the village at different moments throughout a century of Bronxville history.